As I told you in previous posts, we spent the weekend a 5-hour drive away from Nairobi in Eldoret (and another 2-hour drive from Eldoret to Kitale). We had gone there so LeRon could do financial training, particularly budget training, with the branch presidents and clerks. We met wonderful people in church on Sunday in the Eldoret Branch. Fun to be with the missionaries too. Hope you missionary moms and dads will enjoy seeing pictures of your missionaries. Be sure to click on the pictures to enlarge. The Eldoret Branch building was lovely. For sure it will make a nice stake center when a stake is formed. It was well-kept too which was great to see. After the meetings, while LeRon was training the branch presidents and branch clerks, I visited with a few people. This lovely lady married the brother of Evelyn, a woman in our Langata Branch. Both these young women are returned missionaries. The one on the left married in the temple and the one on the right will be sealed to her husband in the Johannesburg South Africa Temple this week. Both these young women plan to serve senior couple missions with their husbands when they are older. That is when the church here in Kenya will really boom. It will be great to have Kenyan senior missionaries! The men were all so willing to stay after 3 hours of church meetings for another more than 2 hour meeting to learn about the tools of budgeting that are available online from the church. The men were humble and teachable, which is the same thing. LeRon loves to teach things he's excited about. And he's definitely excited about putting our financial houses in order, both in the church and in our personal lives. Here's LeRon with all the branch presidents, branch clerks, and President Kogo (far left back row), the District President. He came to the meeting in Kitale on Saturday and then to the meeting on Sunday here in Eldoret. His being there showed the men how important this training is. He set a good example for all. I came into the meeting at the end to take pictures and greet all the men. They are good, hard-working men who want to do what is right. LeRon and I are with President Kogo. LeRon spoke with and shook hands with everyone before we left. He makes people feel important and loved. Glad he is my husband forever. Oh my. Is that what I look like when I don't know someone is taking a picture? Ha ha. President Kogo brought food for all the men since it has been many, many hours since they last ate. Everyone appreciated it. Evelyn's brother and wife. They make a lovely couple with their white shirts and white teeth! They are part of the future of the church here in Kenya. They will raise children who were born into the church and they will raise them to love the Gospel of Jesus Christ from the time they are babies. What a blessing. These two were married civilly less than a month ago. They are being sealed in the Johannesburg, South Africa Temple this week. The church policy here is that if they are sealed within one month of their civil marriage, then they don't have to wait a year to be sealed like most people do. The temple is a 4 1/2 hour plane ride away. It will be great to have the temple here in Nairobi when it's built in the next several years. Elder Muthiani and Elder Coombs met up with us to show us the way to the Langas Elders' flat. They were happy and enthusiastic missionaries. Cute little Elder Muthiani is from Kenya and tall Elder Coombs is from Edmonton, Alberta, Canada. Yeah! He's one of us! Elder Merritt wondered how Kenyans carry such heavy things on their heads. Got the picture in the few seconds that Elder Merritt had "no hands!" Hope his parents get to see this picture! Ha ha. Elder Torrie walked into the picture just as Elder Wambua was picking up a heavy box and Elder Merritt is still trying to balance it. Enthusiastic Elder Muthiani loves to help. Elder Coombs, Elder Merritt, Elder Muthiani, Elder Wambua (on very right). The fellow peeking his head between Elders Muthiani and Wambua was a young man who was helping to unload. Probably a future missionary. 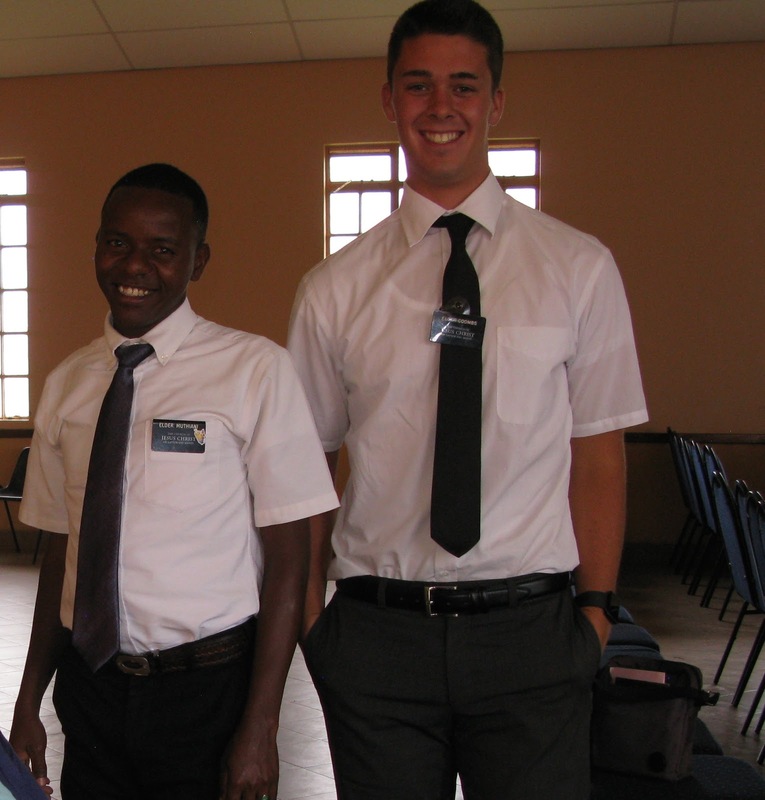 And here is Elder Coombs and Elder Muthiani with someone who wanted in the picture. Kenyans love to get their pictures taken! This picture belongs further up but I've found that I can move pictures around before I put captions on but after the captions it doesn't work so well. Don't know what I'm doing wrong. Here's a look at downtown Eldoret. Just another big city to me! LeRon and I definitely prefer the countryside. For a Sunday evening, it was definitely a busy city. Everyone out on a Sunday evening in Eldoret.